The response to my posts about using Response Notebooks rather than Reading Logs has been wonderful! 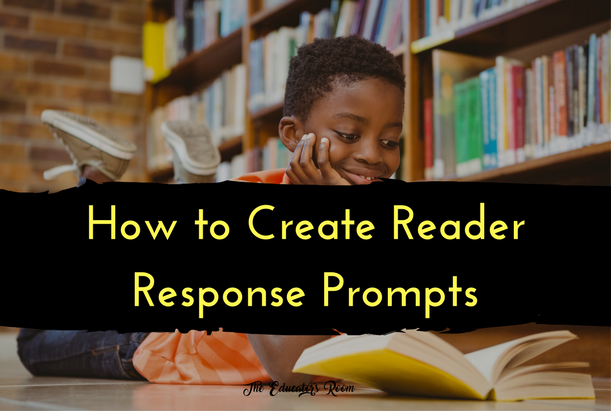 The most common question I get is how to create quality reader response prompts for students to respond to after they do their individual reading. I’m pretty confident that my students think the prompts I give them are random; although, maybe a few have caught on that I tend to try to incorporate skills we are working on–or have learned previously–with our full-class text. When I create prompts I consider the following: what reading strategies we are working on, what close and critical reading skills my students need to practice, and how to move them up to higher-level thinking about their chosen texts. There are seven reading strategies I focus on with my students, and I use these as the foundation for the prompts I create for my students. With these, I weave in higher-level thinking skills like analysis, evaluation, and creation. Because our school has common language for close and critical reading and the use of thinking maps, I also tie that into the prompts as well asking students to summarize, infer, use textual evidence, and explain how author choice affects the reader. Below are twenty examples of prompts that use the reading strategies listed below with close and critical reading skills woven in to help students use higher-level thinking skills. Create a multi-flow map with a major issue of your book in the center. Put everything that has caused it on the left, and everything that is happening as a result to the right. Who is the main character of your story and how do you know? Don’t just say he/she is the narrator because not ever narrator is the main character! Who (or what) is the antagonist in the story and how do you know? Write five tweets that can summarize what has happened in your book so far. Describe or illustrate a character from your book. Use quotes from the book to support your description. Compare and contrast yourself to a character in your book. You may write it/use drawings or you may use a Double Bubble thinking map, but be sure to give evidence from the book! Write some advice for a character in your book. Make sure you sum up with the character needs advice about before you give it. Compare/Contrast two characters in your book–or a character from your book with one from another book you read! Make sure you give evidence from the book(s). Write (or draw) what your favorite parts of your book are. Make sure you explain why you like it so much. Create a flow map of your book so far. This can be written or drawn, but make sure you put page numbers or chapters! Think about all the reasons that adults give to ban certain books. Do you think the book you’re reading right now would be questioned by adults? Why or why not? Give details from the book to support your answer. What do you think would scare or frighten your character? Why? Create a Facebook Timeline for one of your characters. It can have pictures or statuses or links you think your character would post, but it needs to be consistent with who they are in your book. Pick a character in your book and discuss what you think he/she/they would be thankful for. Back up your opinions with proof from the book. Create five hashtags for your book and tell why they fit with your book. Pick a character in your book and discuss what you think would be on his/hers/their wish list and why. What misconceptions did you have about your book? What predictions did you have that were wrong? What did you learn? If you could have a conversation with any character in your book, what do you think you would talk about? Why? We silently read often in my classes, but I give them at least twenty solid minutes twice a week with time to respond to a prompt after. I have no problem reusing some of these prompts, or rewording them in new ways as the school year goes on. Students don’t read the same book all year, so they can answer these for various books. After first semester when students have gotten the hang of how to respond to their reading, I start letting students choose whether they want to answer my suggested prompt or write about what they read in their own way. Most still stick with the prompt because they like the direction, but I get all sorts of great thinking that veers from the prompt as well–and creates great conversations between students when they share their responses with each other. That is really the goal: to create thinkers who can critically discuss ideas.